R. J. 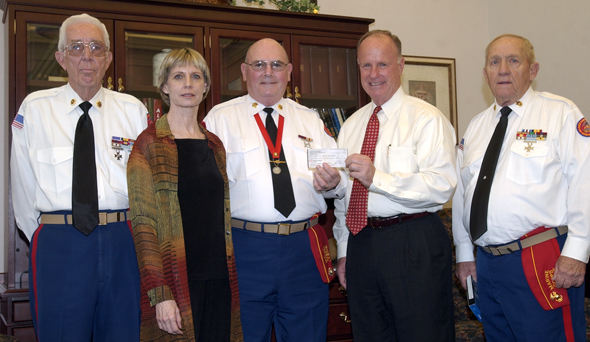 "Bob" Quinn, center, commandant of the Eastex Detachment Marine Corps League, presents a $1,500 check to James F. Gaertner, Sam Houston State University president, to be used to seek funding for future performances of a dance tribute to Korean War veterans. Korean vets Jim Irby, left, and Gene Osborne, right, participated in the presentation. The dance was produced by faculty member Kista Tucker, left center. It started as a way to say "thanks" to a forgotten generation of soldiers, and it apparently struck a chord. The dance department's "Forgotten No More," which was performed at Sam Houston State University in January, has received a $1,500 donation from the Eastex Detachment Marine Corps League headquartered in Willis. Kista Tucker, who produced the Korean War veteran tribute, said the reaction by veterans who have seen it performed, including those who made the recent donation, has been gratifying. She is not ready to let the project die without further exposure. "We will produce promotional packets (including a DVD) and send it to foundations, to granting institutions, and anyone or any organization that might be willing to assist us in getting this project out on the road," said Tucker. "We HAVE to take it to Washington, DC. "To me, this is imperative. And I'd like to perform it at the Kennedy Center if at all possible." Tucker would also like to tour other major cities including New York City, Minneapolis, Chicago, San Francisco, Seattle, and others. The Office of Research & Sponsored Programs is also helping in the search for funding to keep the project alive.